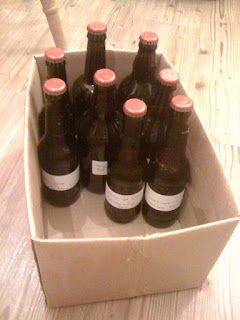 I've decided to 'archive' a few of the homebrew beers I made last year. Some of them were better than others and I'm not sure that they'll all lend themselves to ageing. None the less, it'll be interesting in a few years time to dig them out and see how they've changed. They're all labelled with a name, style, date of bottling and ABV. I plan to box them up, put them in the loft and just forget they're there. Straying from the homebrew theme, I've also thrown in a Fuller's Vintage Ale 2009 (made sense to store it in the same place). The temperature in my loft often gets above 40 deg C, wouldn't this be a problem or is it just during fermentation where high temps need to be avoided? Hmmm, it's a good question and something I hadn't thought of. Yeah, obviously, you want to avoid high temps during fermentation, but what effect would it have on an older bottled beer? I don't know, it would be interesting to find out. I'm sure 40c would kill off the yeast, so any impact yeast has on ageing would be taken away.